I recently returned from spending a week at our home in the Pocono mountains. While there I was determined to prepare a few things for my blog as I hadn’t posted anything in several weeks. 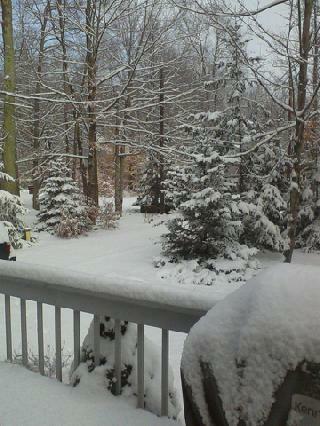 We had a bit of snow – not too much. But it sure was c.o.l.d. !! ++ UPDATE – These Homemade Chocolate Truffles were a big hit. A limit had to be set on the amount of truffles eaten at one time so the children wouldn’t eat them all ! Cooking, when you don’t have all your usual ‘stuff’, can be a real challenge. The original recipe for these truffles calls for a food processor – which we don’t happen have at the Pocono house. So, I decided, seeing as I was ‘sans food processor’, to use a hammer and a zip lock bag to ‘bust up’ the chocolate – and I made the truffles in a large saucepan. Luckily, my efforts resulted in some creamy and delicious truffles!! On left, 6 oz. semi-sweet chocolate. On right, 8 oz. bittersweet chocolate. 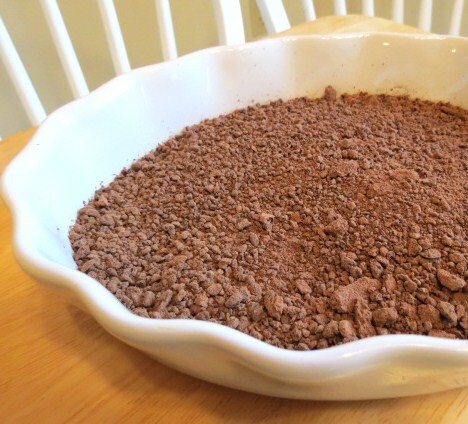 1/3 cup cocoa powder – mixed with 1 Tbs. confectioner’s sugar ++ You do NOT have to add the confectioner’s sugar. I just don’t like truffles rolled in plain cocoa powder, although that’s how truffles are usually sold. 1/3 cup confectioner’s sugar ++ Another option to roll the truffles in. ++ Line a 8″ square pan with aluminum foil. ++ Line a cookie sheet or a tray with waxed paper. Add 6 oz. semi-sweet chocolate, 8 ounces bittersweet chocolate, 2/3 cup confectioner’s sugar and 1/4 tsp. salt to food processor. Whirl 1 – 2 minutes until ground. Set aside. In a medium saucepan using medium heat, warm 2/3 cup heavy cream and 2 Tbs. coffee liqueur just to a simmer. With food processor running, add cream mixture in a steady stream. Process until smooth. Scrape into pan. Chill for 1 1/2 hours. 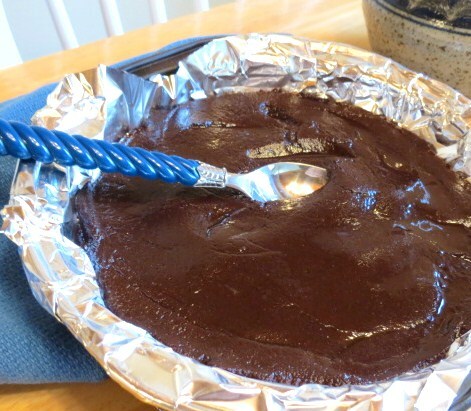 Lift chocolate from pan using aluminum foil. Cut into 36 pieces. Shape into balls. ++ Allow chocolate to warm up a bit – makes it easier to roll. 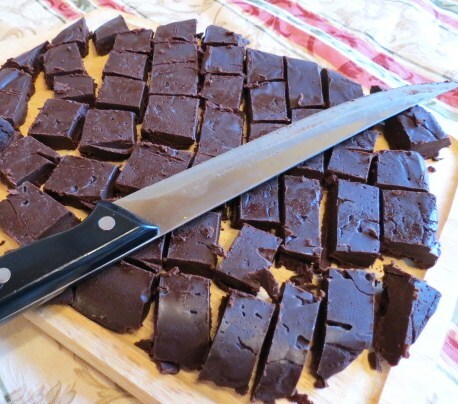 Place chocolate balls on a wax-paper lined sheet or tray. Roll truffles in 1/3 cup cocoa powder mixed with 1 Tbs. confectioner’s sugar OR plain cocoa powder OR just plain confectioner’s sugar. Truffles can be stored in an airtight container for up to a month, not that these will last that long. Enjoy ! 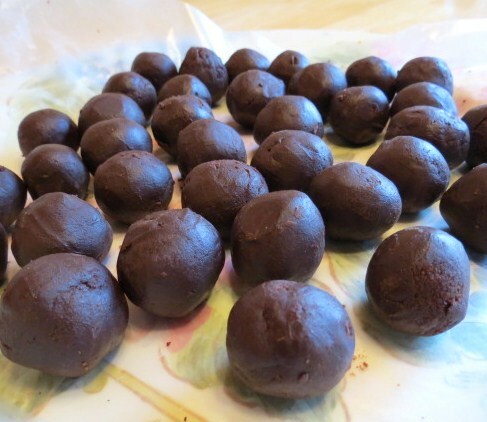 Directions for making these truffles WITHOUT a food processor. Break the 6 ounces of semi-sweet chocolate and the 8 ounces of bittersweet chocolate into pieces. 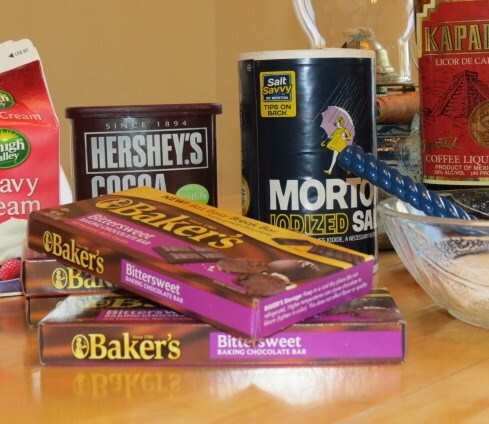 Place the broken up chocolate in a zip lock bag and break up the chocolate further by using a meat tenderizer, a can, a hammer or anything else you can think of, like a rolling pin. Set aside. ++ I got the chocolate into smaller pieces by using the NutriBullet I use to make smoothies. However, it’s not necessary to have the chocolate pieces this small because they’ll melt when added to the warm cream/liqueur mixture. 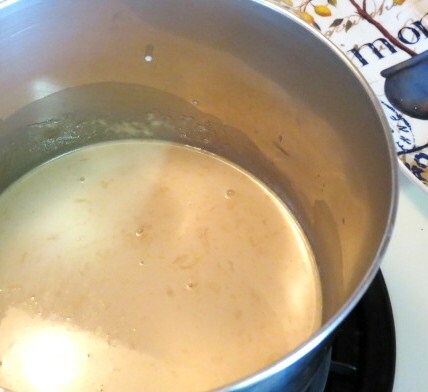 In a large saucepan, over medium heat, warm 2/3 cup heavy cream and 2 Tbs. coffee liqueur – just until it comes to a simmer. Raise heat slightly. Add chocolate pieces, 1/4 tsp. salt and 2/3 cup confectioner’s sugar. 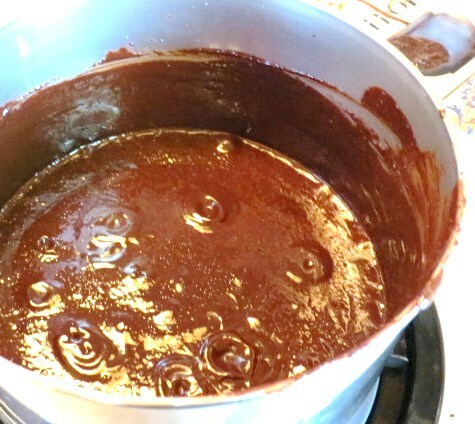 Stir slowly until chocolate is melted and mixture comes to a boil. Remove pan from heat and allow mixture to cool for about 5 minutes. Then, using a large mixing spoon, beat the chocolate pretty hard for about 30 seconds. Scrape into an 8′ pan which has been lined with foil. Refrigerate for 1 1/2 hours. Shape chocolate into small balls about 1″ across. ++ Allow chocolate to warm up a bit – makes it easier to roll. 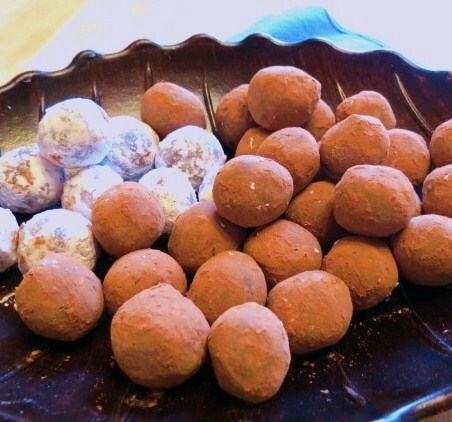 Place chocolate balls on a wax-paper lined sheet or tray. Truffles can be stored in an airtight container for up to a month, not that they’ll last that long. Enjoy! Thanks! I was thinking yesterday that I should re-arrange how I gave the instructions for the post because I first listed make these if you DON’T have a blender. And that’s more work! 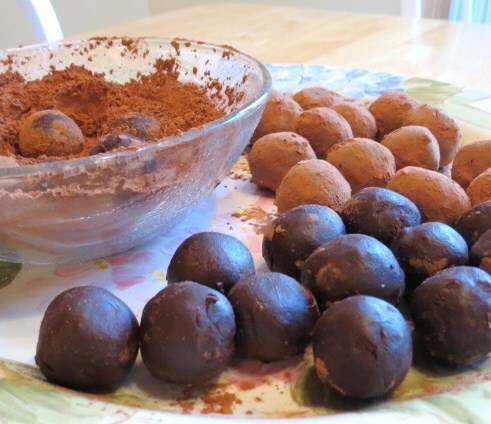 With a blender, these truffles would be a cinch! I really appreciate your commenting. I went to your website and – I hope you don’t mind me saying this – but it’s very hard to understand. I assume you may have written in your native language, then translated it using a program. The problem is, those programs don’t always provide a proper translation. I’m sure you want to do the very best for your business – therefore I highly recommend you have a person who is highly fluent in English re-write your page. Thanks again for visiting my blog and I wish you all the best in your new enterprise! Hi Liz. My daughter-in-law LOVES truffles…. she was really happy with these! I have just finished dinner, (yum) I wish you could give me three or four of those lovely chocolate truffles to accompany my coffee…yum, that would be great! Thanks so much Ayesha ! I was sooo behind on posting recipes that I cooked up three different things at our Pocono house & took photos – then posted them once I got home to Western Massachusetts. I left all but two of these truffles for one of my daughter-in-laws – who LOVES chocolate. Wow, Cecile, these look wonderful! I had chocolate truffles on my list of things to make and give away and I never quite got to them. Perhaps I’ll make them for Valentine’s Day (with my food processor)! Let me know how you like them. I was thinking the same thing – these make a great hostess/holiday gift! And I’m looking forward to making them again – but, this time, with my food processor!! Thanks Mimi – I ate two and left all the rest for my wonderful daughter-in-law, who LOVES chocolate ! Lovely truffles. I’ve only made a couple of flavours and they’re not that difficult to manage once you have the right proportions of chocolate to butter (if using) and whipping cream. The food processor recipe seems sooo easy! I want to make it my food processor next time!